Since the past many days, I have been witness to a raging debate in India over the idea of holding concurrent elections for Parliament and state legislatures. The concept of holding simultaneous state and parliamentary elections is not new in India, though it has never been a constitutional provision. Now, the time is ripe to make it one. The first general elections, held in 1952, saw simultaneous elections for all state legislatures. Elections to the Lok Sabha and state assemblies happened concurrently, not as a rule but as a practice, till 1967. However, the practice got disturbed in 1971, when Indira Gandhi dissolved the fourth Lok Sabha a year earlier than its scheduled tenure. Since then, India has remained a puzzled witness to recurring state elections that keep throwing the administrative machinery out of gear. Mani Shankar Aiyar's rebuttal: Coercive federalism? No, thanks! The idea of simultaneous elections, which was originally floated during the Vajpayee government by L.K. Advaniji, was part of the BJP’s election manifesto in 2014. The issue took centrestage when Prime Minister Narendra Modi floated the concept of ‘One Nation, One Election’ in 2016. Although many counter-arguments are doing the rounds, we have academic theories, statistics and, on top of it, common sense to support the concept. In his book, Minority Governments in India: The Puzzle of Elusive Majorities, Csaba Nikolenyi, professor at Concordia University, Canada, used mathematical modelling to study the voting behaviour of the Indian electorate, and proved that voting percentage would increase by as much as 20 per cent if elections to both the Central and state legislatures were held simultaneously. There is a strong case for the argument. The 2014 Lok Sabha elections saw an all-time high turnout, yet the percentage increase over the turnout in the 1967 polls has been hardly 5 per cent. This, despite the number of voters multiplying by four times over this period. Also, whenever state elections are held together with the general elections, there has been a quantum jump in voting percentage. For example, during the election in Kerala in 1977, and those in Karnataka, Maharashtra and Andhra Pradesh in 1999, where the state elections were held along with the general elections, voting percentage increased by 11-12 per cent. 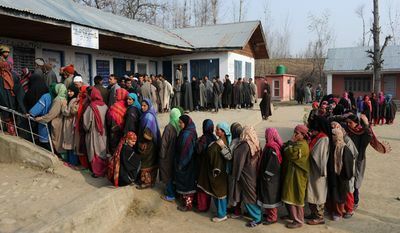 The highest increase has been noticed in the northeastern states where simultaneous state elections with the parliamentary elections have resulted in higher voter turnouts, to the tune of 16-20 per cent. Moreover, there are two strong arguments that go to support the ‘One Nation, One Election’ proposal. The first relates to monetary profligacy, while the other relates to disruption in governance. Monetarily speaking, elections are very costly affairs in India. As per the Election Commission, the 2014 general elections cost the exchequer Rs 3,426 crore; the 2009 polls cost only Rs 1,483 crore. However, as per the projection of the Election Commission, the cost of concurrent elections may require only Rs 4,500 crore, which will be a substantial saving, considering the last Gujarat election alone had cost the exchequer Rs 300 crore. The disruption in governance due to imposition of the model code of conduct is another reality that needs serious attention. As the nation remains occupied with back-to-back state elections each year, a substantial period—as much as four months per year—goes in abeyance, owing to imposition of the model code of conduct. Policy initiatives are held up, and a good chunk of government personnel, too, remain occupied in specific election tasks that seriously hampers governance. All arguments against the proposal are mainly political, rooted in the fear of the regional parties that a simultaneous election with a strong Central government may put paid to all their hopes of winning on local equations. A strong Central government, riding on the wave of performance, may eclipse the regional issues. As far as constitutional amendments to implement the proposal are concerned, they are possible, as many such amendments were enacted during the reorganisation of states in 1956 that led to the creation of new states while earlier ones were dissolved. The bottom line is that India remains trapped in the cycle of elections and, hence, it is imperative to take the nation out from this cycle and put her into the cycle of unbridled growth, disconnecting it from politics.